(also known as Melukote), a historic town in the Mandya District of Karnataka, located about 50 kms from Mysore and about 130 kms from Bangalore. 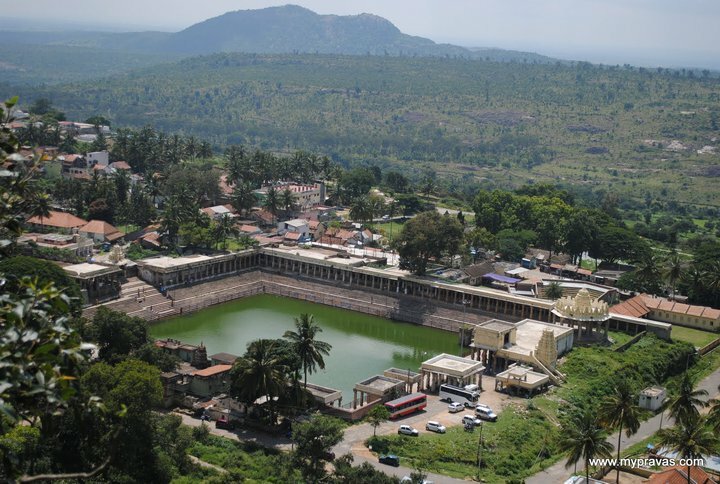 Most of the song has been picturised at the Cheluva Narayana Swamy Temple here. A beautiful view of the temple from the adjacent hill top. 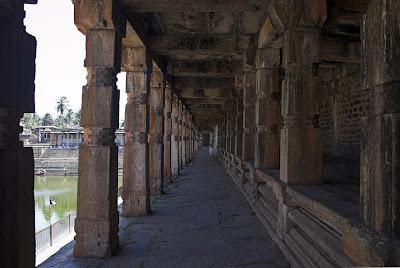 This scene was shot at the pillared corridors surrounding the Temple Tank (which can be seen in the picture of the temple above). (This is the exact place where this scene was shot. Notice the broken stone slab on the floor in both the pictures?). 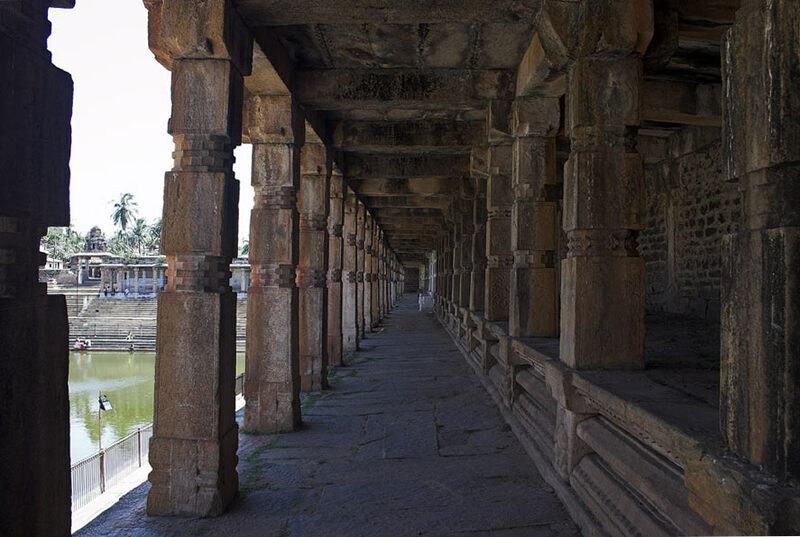 I suppose these corridors should be about 15 ft in height by comparing Prabhas's height with that of the pillars. Like to know where exactly Shreya is sitting in this screenshot? 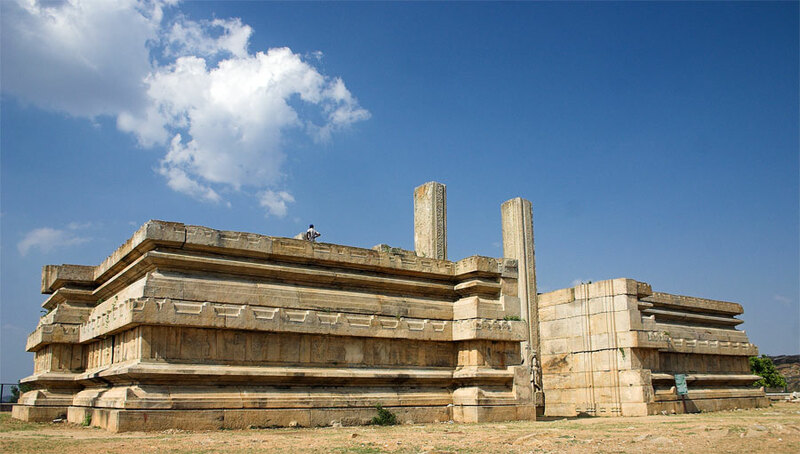 Do you notice a set of small pillars in the corner of the temple tank? 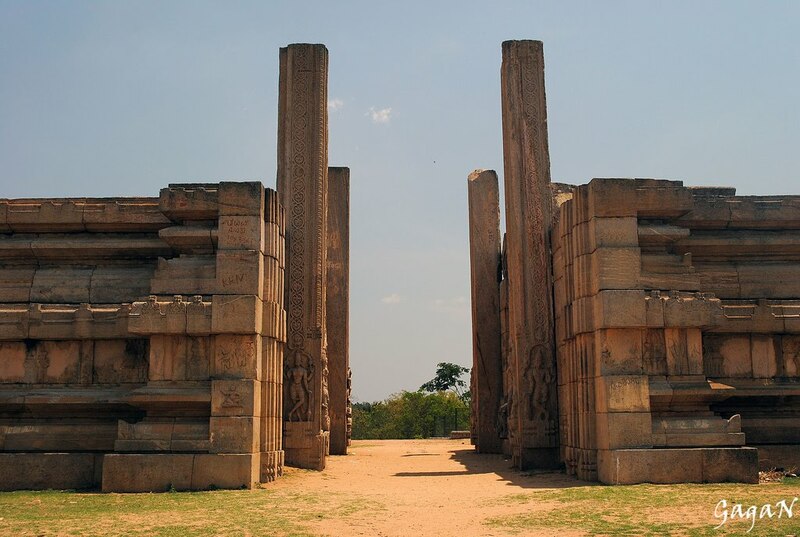 You can see it more clearly in this picture.Notice the smaller twin pillars? That's the exact spot where the above shot was picturised. By the way, the Temple tank is called 'Kalyani Theertham'. I don't know the exact purpose of these pillars, but i suppose they're probably used to measure the water depth in the tank. A few scenes have been shot at the above mandapam. This spot (mandapam & temple) can also be seen in Jinka Vetaki Song from Adavi Ramudu. 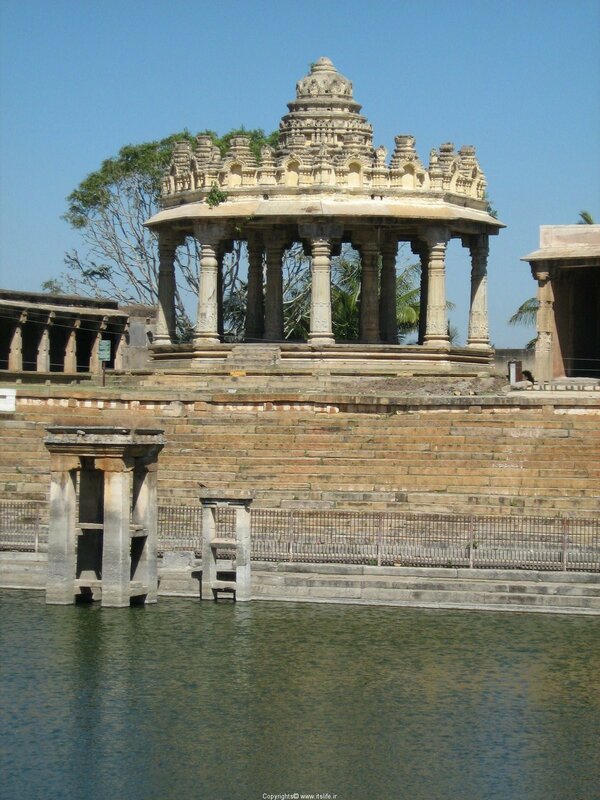 I was not able to find out whether this mandapam has a specific name. 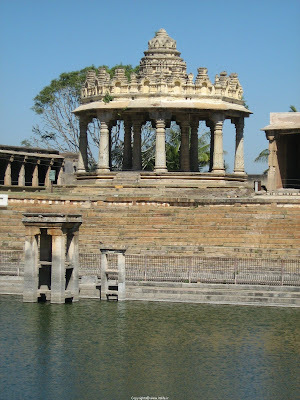 This scene was shot on the steps surrounding the Kalyani Theertham (Temple Tank). Check out the high quality picture posted below. The exact spot where the above scene was picturised. 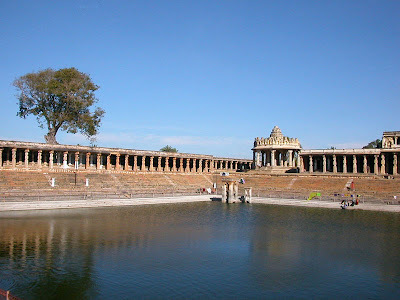 Notice the red painted pillars? 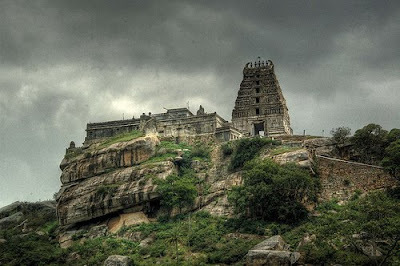 This scene is picturised in the Yadavagiri or Yadugiri hills surrounding the temple. 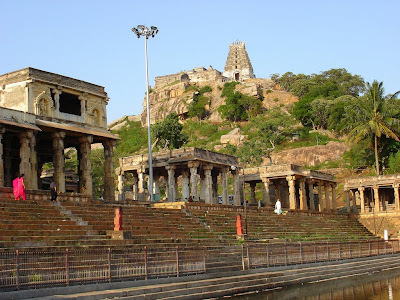 At the back of the pic, on the hill top is the Yoga Narasimha Temple. No info is available on the old temple in he foreground. Here comes a interesting location. 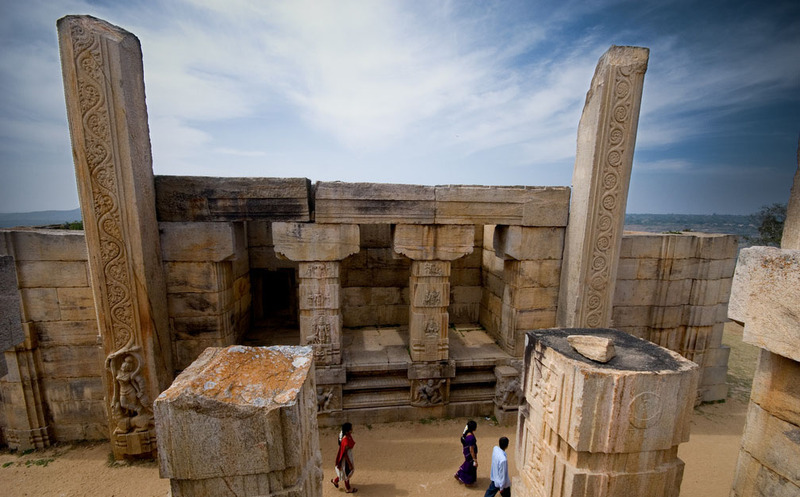 This one's a staple location in many Maniratnam Films. You may also have seen in Rajni's 'Thalapathy' (Rakamma Song) or in the opening shot of Barso Re Megha song from Maniratnam's 'Guru'. 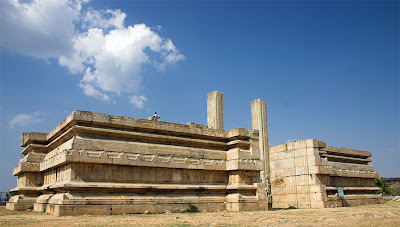 The above scenes have been shot at the 'Royagopura' at Mekote, Karnataka. 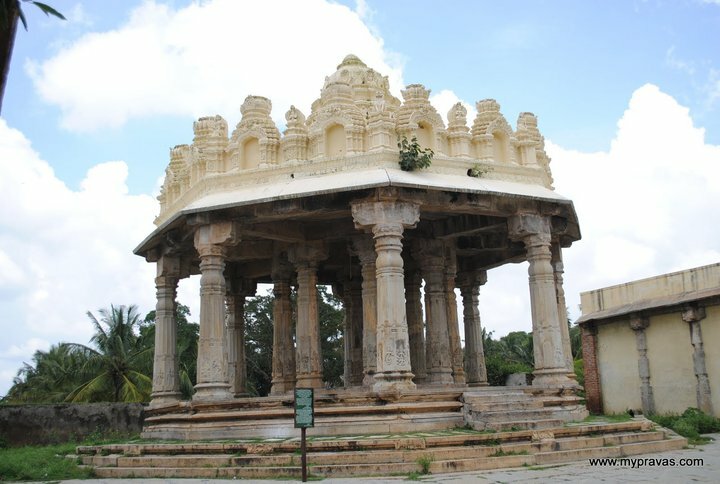 This place is also very near to the Cheluva Narayana Swamy Temple. and a lot of sites for the images.